Downtown Vacaville businesswoman Betty Lucke is, in a word, enthusiastic. The longtime business booster is perhaps best known as a founder of the downtown’s springtime Medieval Fantasy Festival which, every April, brings history, revelry and pageantry to the historic business district along Vacaville’s Main Street and nearby thoroughfares. She was characteristically enthusiastic last month when she contacted the newspaper to propose a new contest which, she felt, would kick the old festival into high gear next year. Normally I take suggestions like these, reply “Sure, sounds great!” and then transfer them to my assistant, Dan Reichl, who doesn’t work here anymore. Betty’s enthusiasm, however, was contagious and I have to admit I was intrigued. I also have to admit that I’ve never successfully transferred a call through our new, state-of-the-art phone system. Worse, it was an e-mail, which is particularly difficult to transfer to the phone extension of a nonexistent assistant. OK, she had me hooked. The newspaper office is, arguably, one of the best-known havens for rubber rats in Vacaville, and sending them sailing through the air for no apparent reason is a regular activity here in the newsroom. Has been for years. Nobody knows why. In a subsequent conversation, the plucky proprietor of the Otter Nature Store pointed out that few things better symbolized the medieval period than rats and catapults.The catapult and its close cousin, the slingshot-like trebuchet, were frequently used to knock down castles and fortified towns during the Middle Ages, while rapacious rodents spread bubonic plague – the “Black Death” – far and wide. Combine them into a modern downtown festival event and you have all the essential ingredients of a lively ratapult competition. How far can you catapult a rubber rodent? How accurately? How quickly can you catapult that rat and reload? The possibilities are endless. If the ratapult catches on, Betty foresees all kinds of creative possibilities – rat costume contests, ratapult vs. ratbuchet, highest-flying rodent and team competitions. “How many times in a lifetime might you be able to hurl a rat from a trebuchet down Parker Street to the accompaniment of a cheering, raucous crowd?” Betty asked. A gibbous moon hangs low over the horizon as a fitful wind whips through the cornfields, rattling the stalks like so many forgotten bones. A nagging uneasiness has crept into your life as the days grow shorter and the nights grow colder. And you should be uneasy, pal – Halloween is just four weeks away and you haven’t yet purchased a single rubber rat to make your home a little cozier, your life a little squeakier. Don’t panic. As in years past, The Reporter has dispatched teams of trained rat-wranglers to help you find the best and brightest of the season’s rubber rodents. Although discount retail outlets have proven fertile ground for Halloween rat bargains in the past, we found the best, most reasonably priced selection of rubber rats at a seasonal Halloween outlet in Fairfield. The Spirit Halloween Store there offers a squeaky, life-sized rubber rat for $1.99 in your choice of designer colors – as long as they’re black, white or gray. Spirit also offers a half-dozen other seasonal rodents with prices up to $29.99 for a menacing rat that’s bigger than a cocker spaniel and 10 times as scary. Their large rats are a better overall bargain. More than a foot tall (or long), these rats come in two models – standing or crouching, both drooling. They’re $8 bucks each, which pretty much beats most other rodent retailers in the large-rat category. Big Lots also has extra-hairy, radio-controlled rats for $12. We’ve seen these elsewhere for as much as $16.99. Sad as it seems, we discovered few other regional rubber-rat bargains. There were rubber cats, rubber spiders, rubber snakes and something that looked like a rubber manatee from hell, but reasonably priced rubber rats were scarce. Our favorite rat-related item was an electronic rat-in-a-mug. These wonderfully annoying, motion-activated devices consist of a rat’s hindquarters sticking out of a coffee mug. The hind legs kick, the tail swirls and the coffee mug erupts in squeaks, gulps, gasps and gurgles. The performance concludes with a satisfied belch. The rat-in-a-mug comes in a variety of styles, and prices range from $6.95 to $12.95. We found ours at a Long’s Drug in Vacaville for $7.99. The newspaper business is, by its very nature, a place where change is the norm. Nothing ever stays the same. If it did, we’d all just fade away like yellowed headlines from the Crimean War. Here at The Reporter, though, one thing keeps happening over and over and over again. Whenever I’m engaged in something uncharacteristically stupid, of questionable legality or in remarkably bad taste, my corporate conscience appears as if by magic and clears his throat. Which might not seem too unusual, except that my corporate conscience is Italian and isn’t even corporate anymore. Strangely enough, whenever I was engaged in one of these singular activities, I could almost always expect that a tall, impeccably dressed chap who was directly responsible for my employment would magically appear behind me and discreetly clear his throat while arching one eyebrow. Editor-publisher Richard Rico seemed to have an uncanny knack of knowing exactly when I was about to do something stupid and would then appear in my immediate vicinity. “How does he do that? !” I inquired one afternoon after our then-publisher had materialized out of thin air while I was quite innocently helping a female colleague with a stuck zipper. Co-workers simply shook their heads. Then one day, my nemesis walked purposefully out the door en route to a new career, possibly as a Navy fighter pilot or some such similar employment. “You won’t have Richard Rico to kick around anymore!” he declared on his way to the parking lot. I observed Richard’s departure with a mixture of regret and relief. We’d had a lot of good times together, but no longer would somebody be looking over my shoulder every time I decided to distribute a gross of inflatable lobsters throughout the building. I’d just sent another U-boat to a watery grave when someone stepped up behind me and cleared his throat. “This is not fair. Not. You can’t clear your throat. You don’t even work here anymore and besides I was just researching stuff. Investigative journalism…” I explained like a fourth-grader caught with a spitwad arsenal. The retired publisher replied by raising one eyebrow and then walked slowly across the newsroom. Three months ago when I proposed humanely winnowing down The Reporter’s newsroom herd of leftover rubber rats from past Halloweens, several of my cynical colleagues – and not a few members of the public – opined that my efforts to find adoptive homes for our decorative rodents would be in vain. And at least two of the hardy Halloween icons had been batted about the newsroom with rackets during an impromptu game of ratminton several years ago. Considering the amount of joy even the most ragged rubber rat can bring into an otherwise dull and lifeless household, though, I decided to press forward in my effort to share the beady-eyed, pointy-tailed surplus with our readers. I was not disappointed. The sometimes quirky but lovable community of Vacaville came through again and the rubber rats that were overrunning our newsroom in mid-October are now down to a manageable number. Thanks to several big-hearted Vacans – and one entire kindergarten class – no fewer than nine of our resident rats have new homes and we have room to walk around without stepping on one of the pesky critters which, unlike real, live rats, do not get out of the way when you’re rushing out to cover a drive-by shooting or pick up a pizza. Among the adoptive Vacans who answered the call were Harry Coburn, Kathy Domenech and Katelin Whipple. Perhaps the most notable rubber rat adoption, however, was made by Linda Patrick’s kindergarten class at Sierra Vista School. We cannot have live critters. We want to adopt a rat. The kindergartners eventually adopted one of our larger, “museum quality” rats and promptly renamed him “Sponge Bob Ratso” because of two strikingly yellow front teeth that reminded them of one of their favorite cartoon characters. Gratifying? You bet! After all, how many other daily newspapers in the United States can boast of receiving their very own celebrity rubber rodent coloring book? Every Halloween season, for more than a decade, The Reporter has sent out a team of canny consumer journalists to rate the season’s crop of decorative rubber rats. It’s been fun, amigos, but here in the heart of our bustling, 21st-century newsroom, we’ve got an unexpected problem due to our rigorous rubber rodent research – waaaaaay too many rubber rats. “I’m being overrun!” shrieked our otherwise unflappable police reporter as a particularly beady-eyed denizen slipped off the top of her computer terminal and crashed down on her keyboard, interrupting a roundhouse punch she was throwing at a photographer. Alas, we were all being overrun. I know that rubber rats are incapable of reproduction, but you couldn’t prove it by our newsroom. We considered a seasonal hunt to thin out the herd but, let’s face it, if you shoot a rubber rat, you’ve still got a rubber rat, albeit one with a big ol’ hole in it. As a more humane – and considerably less hazardous – solution, we’ve decided to let deserving readers adopt one or more of our cuddly newsroom rats. They come in a variety of shapes and sizes, all featuring pointy tails and beady eyes. Some are a whopping 18 inches tall with tastefully decayed incisors and greenish, slimy-looking whiskers. A few are up on their hind legs while others are in the classic “come slither” posture. It should be noted that these rubbery rodents have a few advantages over their real-life counterparts: they don’t die, defecate or devour your doughnuts. And many have long, strong tails that allow you to swing them vigorously over your head during periods of abject boredom. Hey, it doesn’t get any better than that, amigos. It’s easy to adopt a Reporter rat. Just tell us, in 25 words or less, why you want to take home one of our lovable rubber rodents. Our team of newsroom rat wranglers will carefully read and evaluate each letter and award one or more of the beady-eyed fellows to deserving families until we run out. No, this is not a gag. Please include a phone number with your adoption letter. You will be advised when to pick up your rat. Sorry, no shipping. Our accounting department could get a little testy if we start running up three-figure parcel post bills for rubber rats. They’re just kind of touchy that way. Although it’s a little late for Halloween pick-up, all of our adoptable rubber rats are more than suitable to grace your Thanksgiving table or to hang from your Christmas tree. Every two years – give or take 18 months – The Reporter publishes its Halloween rat report to help seasonal consumers find the best and brightest rubber rats in the region. This season, however, we decided to issue the biennial rat report a year early after receiving several calls from rubber rodent fanciers who complained that their pointy-tailed Halloween pals were conspicuously absent from store shelves. At first we attributed this to pre-Halloween consumer hysteria, since many stores began putting out their All Hallow’s Eve finery in late July. We were wrong. A quick examination of retail outlets revealed that Solano County may, in fact, be suffering through the greatest rubber rat shortage since the early days of World War II, when millions of them were melted down for the war effort. Special qualities – the ability to sing, dance or maneuver around terrified partygoers or office mates – also are taken into consideration when dealing with more sophisticated electronic rodents. Strangely enough, we found the largest and best-priced rats at an unassuming Vacaville fabric store. Jo-Ann Fabrics and Crafts had grinning “Chester” rats (some crouching, some sitting) at $9.09 apiece. For 15 inches of jumbo Halloween rodent, $9.09 is a deal in anybody’s book. Jo-Ann’s ultra premium “Creepy Rat” was even bigger, boasted adjustable paws and tail and was covered with gobs of disgustingly rank gray hair, priced at $20.99. Admittedly, you probably won’t want to buy a lot of the latter at more than $20 each, but one is more than enough for most households. We found the best animated rat in a grocery store. The Vacaville Raley’s supermarket had an 10-inch tall, motion-activated “Monster Rat” that bursts into song with “Bad to the Bone” whenever he’s disturbed. This high-energy supermarket rodent is $12.99 and worth every singing, dancing penny. The most economical rats were at Vacaville’s Big!Lots store where life-sized rubber rodents with extra long tails and a hearty squeak were 99 cents each. At those prices, you can easily afford two or three dozen. Mid-October is upon us and, if you’re like many harried 21st century consumers, you have a vague, uneasy feeling that something’s missing – something with a pointy tail and beady eyes. The frost may be upon the pumpkin – or perhaps the persimmon – but there’s nary a rubber rat on your mantle and Halloween is less than three weeks away. Oh, sure, you’ve been meaning to stock up on some snaggly-toothed squeakers ever since the official opening of rubber rat season on Oct. 1, but you never quite got around to it and now you’ve got to do some rapid rodent shopping or your kids are never going to forgive you. Fortunately, the newspaper’s biennial Halloween rubber rat rating report is back to make your autumn shopping just a little bit easier. Every two years the newspaper sends out a seasoned team of rubber rat evaluators to help potential purchasers find the best and brightest rats before All Hallow’s Eve. The rubber rat aficionados also consider a wide range of specialty features – blinking eyes, bushy whiskers, gigantic feet – when making their recommendations. We found this year’s best “personality rat” at the Vacaville Target store. The Target rat is almost a foot tall with big, bloodshot eyes, bristly whiskers, yellow teeth and a grin worthy of Andy Griffith. He’s a little pricey, but one of him goes a long way. A close second – and considerably more economical – is the “Stand Up Rat” we found at the Woodland Wal-Mart store. 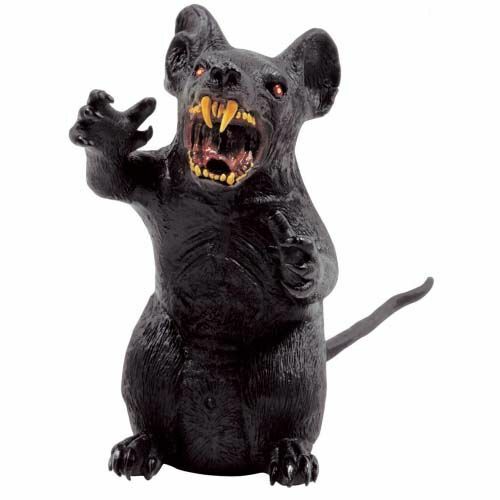 At $6.97 this mischievous-looking example of rattus rubberus is sure to be a hit as the centerpiece of your Halloween dining table or peering out of the vegetable drawer in your refrigerator. Our team found the greatest variety of seasonal rats at the Spirit Halloween SuperStore in Vacaville Commons. There were no fewer than 17 different rats available ranging in price from roughly $1.65 to $21.99 each. These included the economy three-bagger set of “Horrifying Jumbo Rats!” for $4.99, a plush rat hat for $19.99 and a wireless, remote-control “Dirty Rat” for $21.99. The latter marvel is battery-operated, has a plush gray coat, beady red eyes and snaggly teeth. He runs both forward and in circles. Although the package claims he’s controllable up to 40 feet, we were lucky to keep our Dirty Rat going much past 20 feet. This radio-controlled rodent isn’t perfect but, then, how many rats are? We found the best rubber rat bargains at the Big!Lots (formerly MacFrugals) store in Vacaville’s Alamo Plaza. Their basic 98-cent rubber rodent is bigger and squeakier than Spirit’s so-called “jumbo” rats and more than 50 cents cheaper. For the high tech crowd, Big!Lots has a finely-sculpted electronic crouching rat that lights up and blinks in the dark for $4.99.